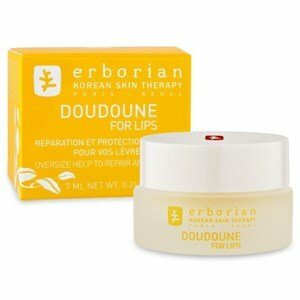 Erborian laboratories improved Herbal's Lip Bome + formula, that features the extraordinary Doudoune for Lips, a vital help to the lips, even under the most extreme conditions. Doudoune for Lips gives an excellent protection, to prevent the damages caused by temperature variations and wind exposure. This protective balm contributes to the repair of dry and beaten lips, due to its rich texture that blends with the skin of the lips to soothe and repair. Formulated with soy oil, rich in vitamins and promoter of natural lubrication, adds antioxidant action to prevent the aging of the lips. Vitamin E gives a high protection and enhances the antioxidant action of soya-bean oil. The Allantoin soothes and calms the assaulted skin, exerting anti-irritant and water retention action, preventing dehydration. Lavender extract, gives an effective moisturizing effect for dry skin, adding shine and softness to lips. Use every day on the lips and dry skins. Use on the cuticles and nails to add shine and hydration. Use on the nose in friction situations, such as colds and flu, to prevent dryness. Apply also on the knuckles of the hands to avoid dryness. Sara is getting married and we'll help her within every step of beauty and care until the big day!